Apple announced on July 17 that Susan Wagner '82 will join its board of directors. She will join current directors Tim Cook, Millard Drexler, Albert Gore Jr., Robert Iger, Arthur Levinson, Andrea Jung, and Ronald Sugar, all former or current CEOs of major corporations with the exception of Gore, former vice president of the United States. The business press has anxiously awaited the announcement, with recent articles in Forbes, Fortune, The Street, and others postulating whom Apple CEO Tim Cook would name, and opining on the need for this company in particular to add diversity to its board by an appointment of a woman, a minority, a young person... but in all cases needing an innovator. The company has found that in Sue Wagner. After earning her degree with honors in economics and English at Wellesley, and taking an M.B.A. from the University of Chicago, she started on a traditional path in the world of finance. Early on, she developed financial services products that were new to the market and set new direction in the industry. Not long into her already successful career, she took the bold move to join the other founders in launching BlackRock, Inc., turning it from an eight-person operation to the largest asset management firm in the world. The Wall Street Journal, among others, quotes Cook in an Apple press release saying, "Sue is a pioneer in the financial industry and we are excited to welcome her to Apple's board of directors. We believe her strong experience, especially in M&A and building a global business across both developed and emerging markets, will be extremely valuable as Apple continues to grow around the world." Bloomberg notes that Cook's appreciation for Wagner's mergers and acquisitions chops may "signal more deal-making under Cook, who has stepped up the pace of acquisitions since becoming CEO." The New York Times Bits blog observes that Wagner will be the only member of Apple's board from a company focusing on finance, translating that to indicate she will be "important for Apple as it continues its transition from underdog in the PC era to industry leader in the smartphone era." Wagner serves on the Wellesley College board of trustees, as well as on the boards of BlackRock, DSP BlackRock (India), Swiss Re, and Hackley School. She’s been honored by Fortune as one of the 50 Most Powerful Women in Business as well as by the National Council for Research on Women. She also has a history of supporting and encouraging other women at BlackRock, via the Women’s Initiative Network. 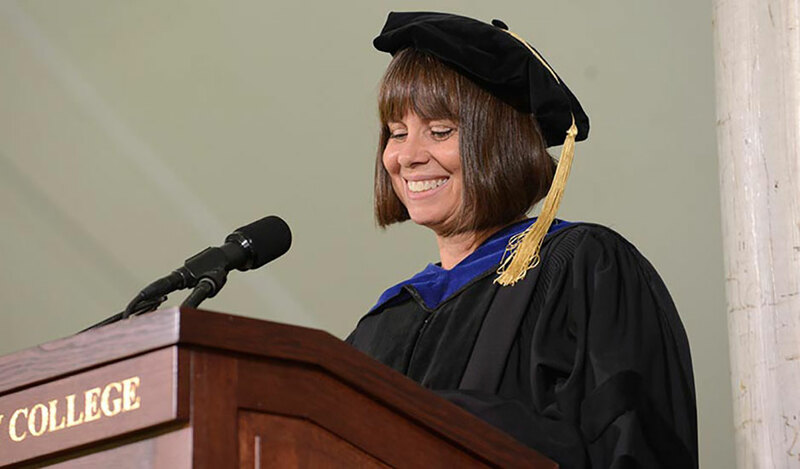 She returned to Wellesley in 2014 to deliver the Commencement address to the graduating class. Not only did she impress the audience with her experience and achievements, she inspired and charmed them with her self-deprecating humor, positivity, insight, and sound advice. No doubt she will bring the same to the company that is "defining the future of mobile media and computing devices."